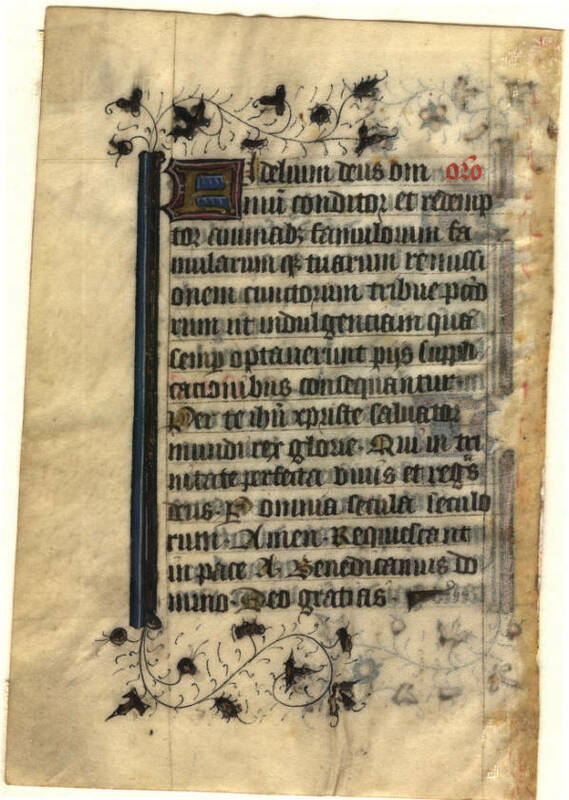 Text: The leaves we have seen indicate that this Book of Hours accords with the Use of Metz; see especially Leaf 28 in the Kent State, Denison, Kenyon, and Lima portfolios for evidence. 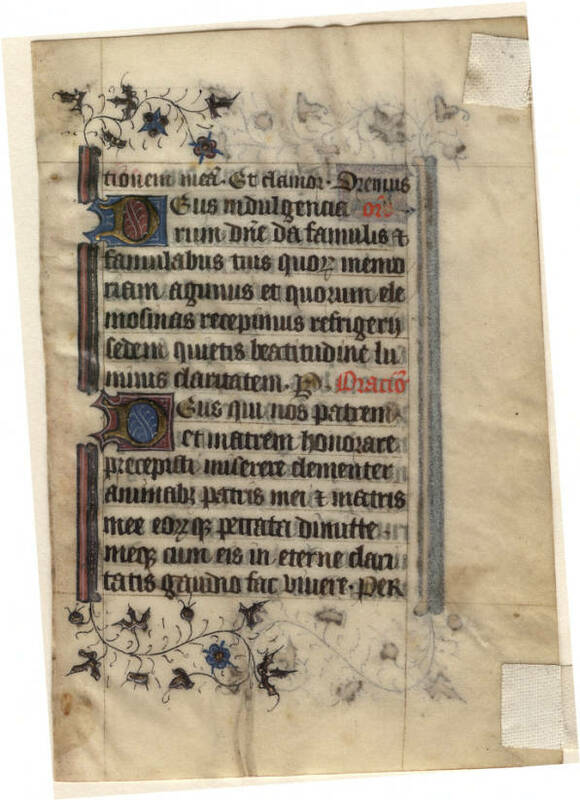 This leaf contains text from the Office for the Dead, perhaps the Vespers sequence. tionem meam. Et clamor. Oremus. Oro. Deus indulgenciarum domine da famulis et famulabus tuis quorum memoriam agimus et quorum refrigerii sedem quietis beatitudinem et luminis claritatem. [ ] Oracio. Deus, qui nos patrem et matrem honorare praecepisti: miserere clementer animabus patris et matris meae eorumque peccata dimitte (vel animae patris mei eiusque peccata dimitte, vel animae matris meae eiusque peccata dimitte): meque eos (vel meque eum, vel meque eam) in aeternae claritatis gaudio fac videre. Per. O God, who hast commanded us to honor our father and mother: in Thy mercy have pity on the souls of my father and mother (or the soul of my father, or the soul of my mother) and forgive them their trespasses (or forgive him his trespasses, or forgive her her trespasses); and make me to see them (or him, or her) again in the joy of everlasting brightness. Oro. Fidelium Deus omnium conditor, et redemptor animabus famulorum, famularumque tuarum remissionem cunctorum tribue peccatorum: ut indulgentiam, quam semper optaverunt, piis supplicationibus consequantur. Qui vivis et regnas in saecula saeculorum. Amen. V: Requiescant in pace. A. Benedicamus domino. Deo gratias. Prayer. O God the creator, and redeemer of all the faithful, give unto the souls of thy servants men, and women remission of all their sins: that through Godly supplications they may obtain the pardon which they have always wished for. Who livest and reignest world without end. Amen. V. Let them rest in peace. A. Let us praise the Lord. Thanks be to God.